For a fast, simple, dessert recipe look no further than tiramisù. This Italian favorite is fun to make and divine to devour. Impress your friends with our authentic recipe for this coffee and mascarpone dolce. Before you start, check the Foodie Sisters in Italy episode on tiramisù! The first thing to do is to make coffee, a strong espresso! When it’s ready, place it in a bowl and let it cool. Separate the egg yolks from the egg whites in 2 separate bowls. We will only be using the egg yolks. Set aside. Now let’s pasteurize the eggs yolks. Put the sugar and water in a pan and place over medium fire. It will gradually turn into a transparent syrup. Using a cooking thermometer, check the syrup temperature. When it reaches 121°C/250°F, the syrup is ready. Be careful because it’s very hot! Whisk the egg yolks with an electric whisk and gradually pour, string thin, the syrup. Continue whisking until the egg yolks become thick, creamy, light yellow, and full of air bubbles. Gently fold the mascarpone into the egg mixture. In another bowl, whisk the heavy cream to semi-stiff peaks. Gently fold the whipped cream in the mascarpone and egg mixture. You are now ready to assemble the tiramisù. Spread a spoonful of the mascarpone mixture over the bottom of your serving dish. Quickly dip the ladyfingers in the coffee (do not soak, they need to be just wet) and arrange the first layer of ladyfingers on the bottom of the dish. Then add a generous layer of the mascarpone cream. Repeat the process with another layer of ladyfingers and cream. Your top layer will be the mascarpone mixture. Sprinkle a generous amount of cocoa powder on the top layer of the tiramisù. This will prevent the top layer from drying out. Place the tiramisù in the fridge and cool for at least 4 hours. The longer the better! 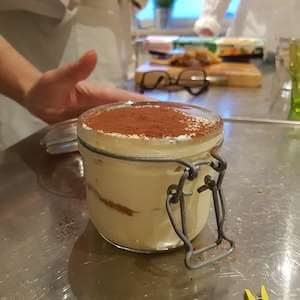 Join our cooking classes in Rome to learn all about tiramisù. Get the recipe for Italian tiramisu. Make this delicious yet simple layered dessert with coffee, mascarpone and ladyfinger biscuits with our step-step instructions.